Barry Allen may have tried to restore the original timeline, but not everything remains the same. Iris and Joe don't talk, Cisco isn't himself, and Barry has a new lab partner. As Barry tries to maneuver this third timeline, he encounters a new villain who shouldn't exist at all. I was so happy to see Felicity in this episode. One of my favorite things about the CW superhero shows are the character crossovers. Plus it was perfect that Barry went to Felicity to express his frustrations and problems with the new timeline. Adorable. Yes! Jay Garrick might be sticking around. I think Barry needs someone--a speedster someone--to help mentor him. He's still kind of young and inexperienced. 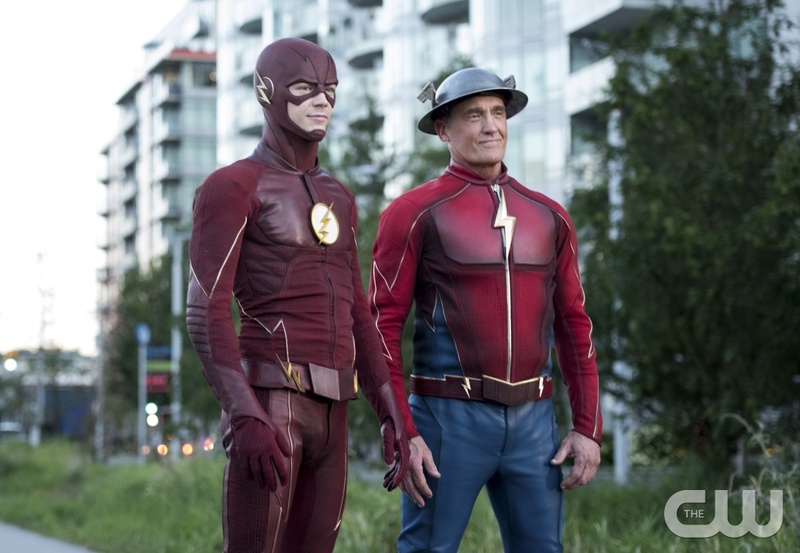 Jay Garrick, being the doppelganger of his father, seems to be the perfect person to help Barry become an even better speedster. His explanation of the time travel is spot-on as well. While I was a little sad about Cisco in this episode (more on this later), I was delighted to see him using his powers to help Barry fight the Rival. There's hope that he will continue to grow into his abilities and maybe join Barry out on the field. Look at my little Cisco growing up and saving Central City (*wipes tears*). Caitlin, on the other hand, seems to be pretty normal in this episode--until her hand started freezing over! Will this be the origin of Killer Frost on Earth-1 or a new hero for Central City? Either way, I'm stoked to see what's next for her! I was really sad that Cisco didn't seem like himself. In the Flashpoint timeline, he was more himself as a billionaire than he was in this new timeline. We learn his brother, Dante, died, and Barry refused to change the past to save him. Cisco is harboring a lot of hurt and bitterness, and I don't like it. Toward the end, he starts to lighten-up, but I was worried for a while. Hopefully, he can learn to move forward like Barry has. I was also sad to learn Iris and Joe weren't talking because Joe kept Iris' mom a secret from her. While I can understand why she would act like that, I don't know why she's doing it now since she didn't in the original timeline. However, my biggest complaint is that by the end of the episode it seems like they are on good terms again--although nothing significant changed that. I was hoping there would be a larger process to their reconciliation. But whatever. Just like with the first Flashpoint timeline, I'm still a bit skeptical about the changes to the timeline. Why does Barry's mother dying or not dying affect certain outcomes like Iris reacting differently to her mother being alive or Dante getting in a car crash or that Caitlin suddenly is exhibiting her frost powers? I like the time travel and the paradox ideas, but I feel like there still needs to be genuine reasoning behind why certain things change. Overall, I think this episode was good. It wasn't great. It wasn't bad. It was a standard TV show episode. I'm hoping as the season goes on we'll get more exciting things, but for now, I'm okay with how this is turning out. Barry is learning a lesson; he is growing as a speedster and a hero. What did you think of "Paradox"? How do you feel about this new timeline?